Clipping coupons or finding printable coupons online can be a real money saver at the grocery store. You don't have to invest a lot of time clipping or printing grocery coupons, either. By following a few simple strategies, you can learn how to properly clip coupons to make the most of your time and money. Before you even start clipping coupons for the week, go through your grocery store circular to see what's on sale. Come up with a grocery list based on sale items for the week. 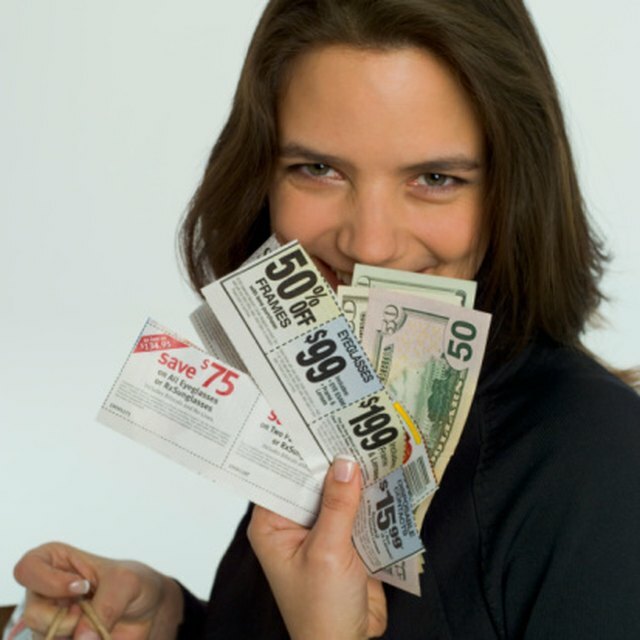 Cut coupons from the newspaper or print free online coupons. Only clip coupons for items on your list, items not on your list but that you regularly use, or items currently on sale that could replace another product on your list. If you find a coupon for an item that is a different brand from the one you usually buy, try switching it up. Just make sure the price of the item minus the coupon discount is still cheaper than the price of the brand you normally purchase. This is especially important if you regularly buy store-brand items. If you come across a coupon for an item that you normally use but you don't need it this week, clip it anyway. Save it in your coupon folder for one of the following situations: Use the coupon if you run out of the item, if you still have the item but it's on sale at the store (say it's two for $5 and you have a 50-cent coupon) or if the coupon is about to expire. If you come across a coupon for an item that you would not normally buy but you know the item is on sale and it can replace something on your grocery list, clip it. For example, your family usually prefers ice cream as a dessert, so you have that on your list. But let's say you come across a $1-off coupon for pudding snacks. You know from your store's circular that the same product is on sale for $2.50 instead of its regular $3. In this case, clip or print the coupon and use it to get the pudding dessert instead of the ice cream. Your family will still be able to satisfy its sweet tooth, and you can save money by purchasing an on-sale/coupon dessert instead of full-priced ice cream. Get the ice cream next week when it's buy-one-get-one-free. Go through your grocery list and put a star next to any item for which you have a coupon. Make a note of the specific brand and any special requirements (i.e., must buy two) next to the product. Immediately after putting the item in your cart, pull your coupon from your file and place it somewhere you won't miss it (the front of your file, your pocket, your cart). When you go to check out, you'll have all of your coupons together. This way, you won't be stuck looking through a pile of clipped coupons while you're rushing to pay. Go through your coupon file each week to weed out coupons that are about to expire or have expired. Having too many coupons in your file will make it more difficult to find the coupons that you can use. Don't over-clip. The biggest money trap when it comes to coupons is clipping for items you never use just because of good deals. If you never eat chips, then don't clip a $1 coupon for them. You can save $3.50 by not buying them at all. Go through your coupon file each week to weed out coupons that are about to expire or have expired. Having too many coupons in your file will make it more difficult to find the coupons that you can use!